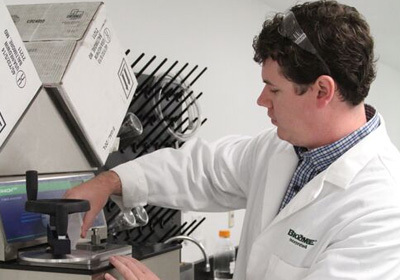 BioZyme Research and Development Coordinator Gary Baumann places forage samples in an Ankom 2000 Fiber Analyzer to retrieve the fiber value of the samples. BioZyme, manufacturer of Amaferm®, Sure Champ®, VitaFerm® and other proprietary, natural feed supplements for cattle, show livestock and commercial poultry and swine, is offering complimentary, custom hay testing and nutritional analysis to cow/calf producers through its nationwide dealer network. The lab analysis and resulting report will provide producers with the information they need to understand when protein or energy is needed to maximize performance in their herds. In addition, the report indicates which months since calving the producer should be supplementing protein and/or energy, or when the hay is meeting nutrient requirements and supplementation is not needed. If testing determines that the forage quality is high, the producer can offer less supplementation, resulting in savings. Conversely, if the forage quality is low, diet supplementation will be recommended to improve animal performance and increase profits. “We custom fed cattle and when they sold, the owner said, ‘whatever you do, keep feeding that mineral!’ The rations you put together were not only cheaper, but the cattle gained .5 lbs faster. It was like 21 free calves in 150 days. We are absolutely thrilled with Amaferm and the nutrition team at BioZyme,” said BioZyme customer Evan Sauter of Linton, ND. • Maturity of forage – quality generally declines as the plant matures. • Type of forage – legumes generally have higher protein content than grasses. • Harvest and storage – improper storage can reduce quality, primarily through leaf loss. • Environment/climate – moisture, temperature and sunlight can influence quality. • Soil fertility – balanced soil fertility is necessary to avoid mineral imbalances. • Variety – decades of breeding forages have allowed for improved yield, persistence and quality. There are two ways producers can take hay samples for testing: with a hay probe or by hand. Regardless of the technique used, the sample should be representative of the entire lot, meaning that sub-samples should be taken from around 10% of the total bales in the lot from a minimum of 10 corings and/or hand grabs. For information and video tutorials on how to take a proper hay sample, visit http://www.vitaferm.com/testyourhay/. To obtain a complete nutrient analysis of the sample, the producer must submit hay samples to a BioZyme Area Sales Manager, preferably through their nearest dealer. A list of dealers is available at http://www.biozymeinc.com/find-a-dealer/. Once the sample is received, it will then be delivered for lab analysis and the results emailed to the producer as well as the producer’s local BioZyme dealer and/or area sales manager. The results will also be submitted to the nutrition team at BioZyme, which, if the producer so desires, will provide the producer assistance in ration balancing based upon the producer’s production scenario, access to available nutrients and performance expectations.